Perhaps this is the big day when you are buying yourself a rifle safe. Many gun owners do not bother, especially if they only have one or two guns or rifles. They only put their gun on a shelf or in a cupboard instead of investing in a safe. But if you have teenagers in your house, keeping your gun in a closet is not a good idea as little hands can and most likely will find your weapon. While you can hide your gun in a different cupboard, a better idea would be to consider rifle safes. One way to go about buying a safe is to head on to the gun store and choose a safe from the ones they have available there. The people at the weapon store can explain the details of the different safe to you. They will reveal information such as what kinds of opening it may have, the metal it is made from, whether it has a place for scoped rifles, the type of locks, shelves and drawers for storing ammo or even other valuables. The salesperson will also be able to explain to you how to bolt the safe to the floor or wall, depending on whether you buy a wall safe or a floor safe. There are all different kinds of safes at the shop – some resemble the lockers at a gym and are just plain ugly, and others are downright beautiful and make a nice addition to the room’s decor. It is just amazing how much variety there is in the gun safe market. However, it may be that the shop does not have the type or size of safe you are looking for, and this is where internet shopping comes in handy. You can buy pretty much any safe online these days and have it shipped to you. 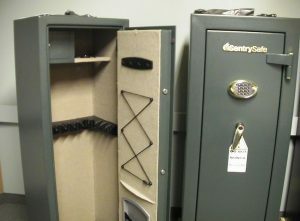 Take your time as you look at different rifle safes: you should not rush into buying one if you are not entirely sure. Compare different things, such as fireproof features, what it looks like, what kind of lock it has, whether it weighs enough that a thief cannot pick it up and walk out with it, and of course how much it costs. Choosing a safe should be a life-long investment – that is how long it should last unless of course you enlarge your gun collection and need a bigger one.